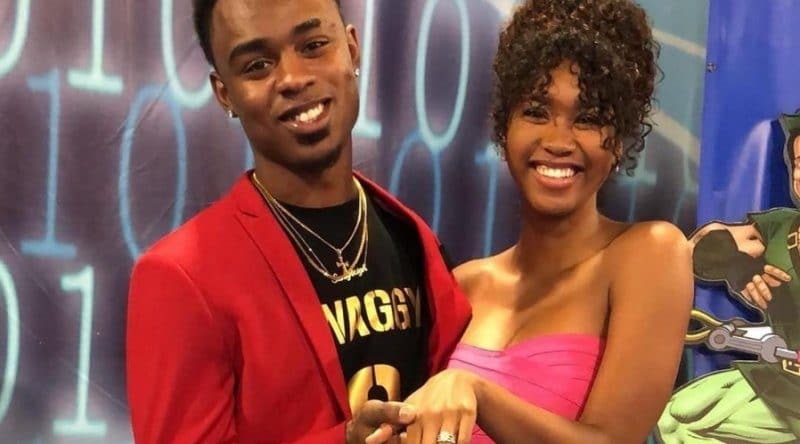 Big Brother News: Bayleigh Dayton Pregnant – Swaggy C Confirms Instagram Story Spills All? Big Brother 20’s Bayleigh Dayton is pregnant according to a savvy insider that caught something on Instagram. It looks like Swaggy C Williams and Bayleigh are starting a family. The proposal on BB20 finale night now makes so much more sense. It seemed fast that he dropped to one knee after they’d known each other just a few weeks. But with a Swaggy C and Bayleigh baby on the way, it looks like they’re both winners. 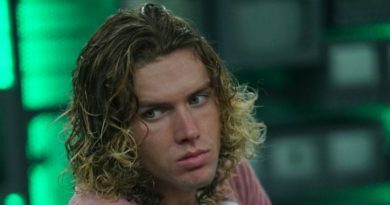 For those that watch Big Brother live feeds, you might recall the night before Swaggy C Williams was blindsided and evicted, he talked to Faysal “Fessy” Shafaat. Swaggy confessed that he and Bayleigh Dayton had gotten busy and was going to ask production for a Plan B pill. A Big Brother insider with production revealed that a request for a Plan B pill must come the female. Now it looks like she never asked for the “whoops” pill because Swaggy leaked on Instagram that they’re pregnant and they promised an upcoming announcement. The Big Brother news on their pregnancy came from the Twitter account DukeTheBBDuck. The account is owned by someone associated with the show because they always have BTS footage. The recent activity is all short videos from the after party chock-full of BB20 houseguests reveling. 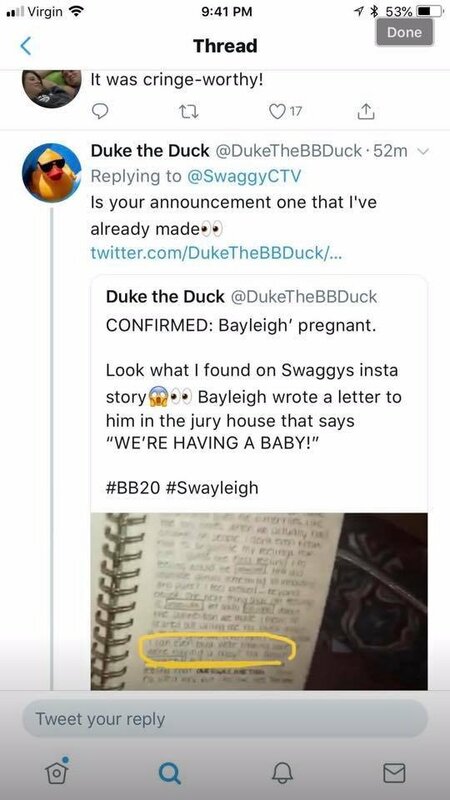 But the BB Duck tweeter also grabbed something from a Swaggy C Insta-story where he posted a letter that Bayleigh wrote him from the Big Brother jury house. You can see the image above and the leaker wrote “CONFIRMED: Bayleigh pregnant” and he posted the letter. Pregnancy Hormones Caused Bayleigh’s Rage in BB20 House? Big Brother viewers saw Bayleigh Dayton go ham on Tyler Crispen right before she left the house. Remember when she bit her mouth and had blood spewing? Her reaction seemed over the top even for BB drama. Was that a hint at her delicate condition? Everyone knows that pregnancy hormones can make you crazy and if she was alone in the house, pregnant, and missing Swaggy C, it could certainly explain things. Bayleigh’s screaming and crying fit makes a lot more sense if she was dealing with an unexpected pregnancy. Assuming this leak is legit (and it looks to be), that’s yet another Big Brother baby. 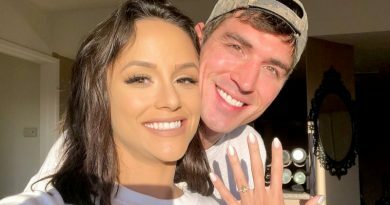 Soap Dirt reported Cody Nickson and Jessica Graf’s pregnancy this week. Theirs will be the fifth BB baby and Swaggy C and Bayleigh’s will be the sixth. Big Brother has a better track record of happy marriages and baby making than The Bachelor or Bachelorette franchises and now they’ve done it again. Congratulations to Swaggy C Williams and Bayleigh Dayton on their engagement and baby news! Soap Dirt Update: After Bayleigh’s pregnancy news broke here and elsewhere, the couple came forward with some sad news. Swaggy C and Bayleigh Dayton released the following YouTube video saying Bayleigh miscarried while in the Big Brother jury house. 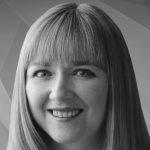 Our deepest sympathies go out to Ms. Dayton and Swaggy C.
Check back with Soap Dirt often for Big Brother spoilers news and other reality TV updates. ← General Hospital Spoilers: Kelly Thiebaud Returns – Britta Meets Peter and Helps Brad With Baby Fiaso? Writing is my passion and so are soaps. Working for Soap Dirt brings all my interests together. I'm a 10+ plus General Hospital fan and enjoy B&B, Y&R, and many reality shows including Big Brother, American Ninja Warrior, Survivor, and more!